Pisgah Pete will once again make an appearance at the White Squirrel Festival this year!! He has become a mainstay in Brevard, making appearances many times throughout the year! His handler, Jennifer Burgin will be accompanying him. Jennifer is a local wildlife rehabilitator. Don’t miss him at this year’s White Squirrel Festival where he will be winning over new friends with his cuteness! In addition to the many other activities and educational opportunities at his booth, he welcomes the author of Tales from Farlanida; Ozette’s Destiny and Tales from Farlandia: Ozette’s HeartStone, Judy Pierce. Both of these books feature the antics of our white squirrels. Ms. Pierce will be holding a book signing during the festival and will have copies of her book for sale. 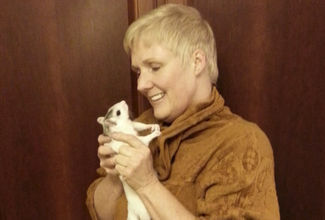 A portion of the proceeds from book sales will go to local wildlife rehabilitation efforts, including rescuing white squirrels who find themselves in peril. wanted me to write you so this could be included in the description of the activities at her booth in the schedule and other advertising you might be doing. Sat. May 23 from 10:30am-2:30pm at Pisgah Pete booth. You will also have an opportunity to adopt a white squirrel, with proceeds going to our local rehabilitative efforts.